May the force be with Wigan Athletic ace! Star Wars fanatic Antonee ‘Jedi’ Robinson is adamant Wigan Athletic have it in them to push for mid-table this term, and not just settle for avoiding relegation from the Championship. And the jet-heeled Everton loanee hopes to provide the phantom menace down the left-hand side to give Latics that extra edge going forwards. “The gaffer’s been really great in saying he really wants the full-backs to bomb on and support the forwards,” Robinson told the Wigan Post. “He doesn’t want us to be afraid of facing anyone...because we’re also the threat to them. The 21-year-old arrived at Wigan earlier this month from Everton despite intense competition from Bolton, with whom he spent last term on loan. He says once he learned Latics were interested, there was no decision to make, and he’s confident this season won’t be just one long struggle as it was last year with the Trotters. “I’ve got no doubts or worries that we won’t survive in this league to be honest,” he said. “The way we play, there will be times when we have good results and bad results. “But overall that style of play should carry us to where we want to be, and I’m quite optimistic that will be the case. “Having played in the Championship last year, I know the games come thick and fast and it’s a very high standard. “But it’s a great set of lads here and I’ve really settled into the style of play we’re been playing. “I’ve been told to come and here and get my head down, get some games under my belt and experience. Robinson could not have made more of an impression on his debut last weekend against Sheffield Wednesday, when a remarkable 80-yard run from the edge of his own box to the opposition byline helped lay on the opening goal for Michael Jacobs in a 3-2 victory. “I didn’t realise I was that fast until I saw the clip of the first goal!” he laughed. 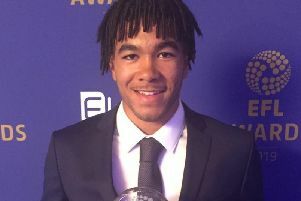 It’s not been an easy transition for Robinson, with fellow new-boys Reece James and Cedric Kipre also being handed their debuts against the Owls. But he says the presence of the likes of Chey Dunkley and Sam Morsy has helped them to find their feet. “It’s definitely been tough with there being so many new players being thrown in all at once,” he added. “It’s never going to be perfect straight away, but the more games we play the more we’ll get used to each other. “At the minute we’re organising each other as well as we can, and it’s very much a work in progress at the minute. “We’re obviously depending on people like Sam Morsy, he’s a great captain and very keen to protect the younger lads.